The Rev. Dr. Nancy Wilson, author of I Love to Tell the Story, is a retired Moderator of the Metropolitan Community Churches. She spoke and preached at churches, universities, and organizations globally during four decades of ministry. Dr. Wilson was recently elected to be Co-Senior Pastor of SunCoast Cathedral MCC in Venice, FL. She will discuss experiences of pastoring on the margins as an open lesbian at the intersection of many communities and issues. All events are at WATER and by phone. All are free and open to everyone. Today I chose as a scripture this simple, very familiar story – Jesus welcoming children. It was a Jewish custom, to have rabbis, or leaders, spiritual leaders, bless children. Parents came with their babies, and children, and maybe some children found their own way that day to Jesus. Jesus, an itinerant preacher was a phenomenon, something of a celebrity, coming to their town. A rabbi who healed people, told stories, spoke of God in an intimate way. The story’s simple arc then shifts to the disciples who try to shut it down. We really don’t know why. Maybe in the tension that was happening in their ministry, blessing children seemed trivial. In Mark’s gospel, the disciples often do not seem to get Jesus, or what he is doing. They are trying to help, but, they mess up. They step all over Jesus’ message and mission. We light the 4th candle of Advent, the “Love” candle, as the northern hemisphere is at its darkest. Right now, cold, Arctic weather sweeps across the US. In Florida, we have fog, which we have so rarely. In the deepest darkness, love was born, in the womb of a young Mary of Nazareth. In the deepest darkness, love was reborn in the tomb of Jesus, which could not contain him, or that love. Today I had to force myself to read the news about Aleppo, Syria, an epicenter of darkness during this Advent. 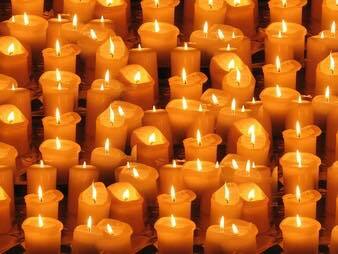 One Little Candle: My Thoughts as We Begin Advent. . .